Thankful for YOU This Season! Hello out there in Quilt Lovers Land! Thank you to everyone in Houston who came to Market & Quilt Festival! Also, a BIG thank you to everyone behind the scenes who make this huge show run smoothly for all of the vendors! Dani just got back from the west coast at the Puyallup, Washington show, where we had a good turnout, thank you! 2017 has been great and is coming to a close. Here at Block Party we are starting to wind down for the year. No more shows until 2018 & we are all thankful for this time to be home with our families! We still have things to share! 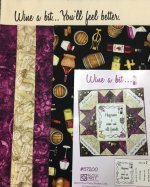 1) First, we have kits for our new panel/pattern "Wine A Bit..." they retail for $36 HERE. 2) WE also have "Let's Fight Together" Kits ready at a bargain of $39.50 HERE. 3) Looking for a quick gift project, you might want to consider this festive little table topper kit for $19.95 HERE! 4) **Row By Row** Kits are now available!! Call to get yours before they're gone! Only $13.95 HERE. We are ALWAYS thankful for you! 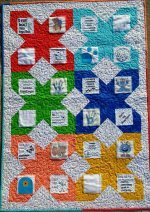 Without you, we could not continue to bring you printed words to put in your quilts and patterns to go with! May your list of things you are thankful for be long!